Does “Tech for Profit“ run the economy? Some expressed the belief that regulation will be one big driving force to move the economy away from the “profit” to the “good.” Well, we all know the snail’s pace of government…so, while regulation takes it’s time, let’s look at another approach. Elaine Skapetis, Front End Engineer and Diversity Influencer at Adobe, also presented during the event. Adobe has programs dedicated to youth and fostering diversity. Adolescent Youth Voices empowers young people to harness creativity and digital skills to create change in their lives and their communities. Through a network of dedicated educators, Adobe has inspired young people to be intentional and impactful in their media making, to create with purpose. By teaching them to tell their stories via digital media, they’ve helped build their creative confidence to spur social change. In an effort to diversify tech’s future, Adobe Digital Academy awards scholarships for web development training and offers real-world experience to underrepresented minority candidates — helping them make the transition to technology careers. Robert Sum closed the evening by introducing “Home of DigIT,” which is coming this October. 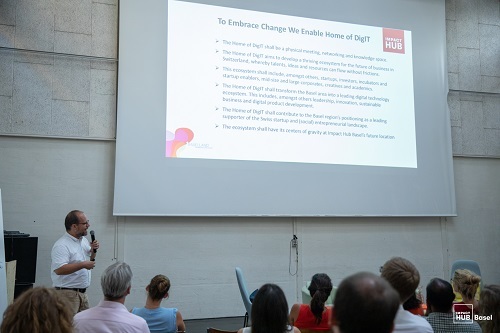 Not only will this transform the Basel area into a leading digital technology ecosystem, but by doing so it will address two of the SDGs (Sustainable Development Goals): (4) Quality Education and (8) Decent Work and Economic Growth. Stay tuned for more on that!